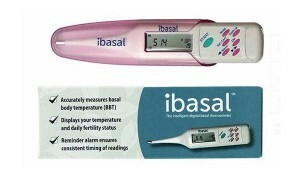 Is This the Most Intelligent Digital Basal Thermometer Out There? Ever notice that the word “mom” is in thermometer? Although fertility charting has a tendency to make my brain a little nutters (The tracking! The graphs! The waiting! ), that’s not to say that I don’t recognize how awesomely beneficial it is. I mean, with just a thermometer you can learn A TON about your cycle, including if you’re ovulating and even if you’re pregnant. And after taking several months off from actively “trying,” my husband and I are now getting our ducks in a row to give it a serious go again. We’re going to see a reproductive specialist, I’ve found an acupuncturist that I like, and we’ve both cut coffee (linked to lower get-pregnant rates) and gluten (linked to unexplained infertility and generally gives me digestive probs that no one needs full details of) from our diets in an attempt to boost fertility. The break from trying has been good for us, and I’ve made peace with a lot of fears and worries. Enough so that when Fairheaven Health gave me the chance to try its ibasal digital thermometer a month or so ago, I said “yes,” without feeling dread or, honestly, panic at throwing myself back into that headspace of obsessive tracking. I know our acupuncturist wants a cycle or two of fertility charting and temperature recording for when we get started, so this was the perfect way to do just that. First off, the ibasal ($60) is more than just a thermometer—it’s like a little mini computer! It measures your temperature to 1/100th of a degree, it stores your readings, and it interprets the data to predict when you’ll ovulate and tell you if you might be pregnant. It also gives you one place to record other info about your menstrual cycle, like bleeding, cramping and cervical fluid. You have to track for a couple of cycles to get the full benefits, but it’s like a fertility-charting one-stop shop! And, I have to say that everything it does is impressive. Basal body temperature (BBT) charting isn’t easy—it can be cumbersome, confusing and even cell phone apps can be inconvenient to use if for some reason you’re not near your phone or it’s not fully charged. But this? Well, it does it all. Including serving as an alarm. At first, this is awesome because to ensure charting accuracy, you have to take your temperature at the same time every day. But what happens if you travel and are in a new time zone? Or are early in your cycle and know you’re not going to ovulate and—FOR THE LOVE OF GOD—just want to sleep in a bit without an alarm? Well, thankfully, the ibasal does give you the option of changing your alarm time or turning it off entirely. Thank goodness! And the off setting for the alarm was a serious bonus for me. Because I found the alarm sound to be jarring and not a great way to wake up. (I usually wake up to music or my cell phone alarm that’s kind of whimsical sounding—not a loud beep, beep, BEEP!) In fact, when it went off, I’d wake up startled and would spend five minutes trying to shut the dang thing off and take my temp without turning on the light to wake up my husband. This was darn near impossible. Not to mention that the thermometer itself is kind of heavy, and sometimes it felt like I’d have to hold it in my mouth for forever before getting a reading—okay, maybe it was just five minutes, but that’s a long time to wait when it’s 2:45 a.m., you’re in L.A. for work, and you are just so darn sleepy. Maybe it’s just me though. There are plenty of glowing reviews here. And there’s no doubt that the concept and what it can do is nothing short of amazing. Amazing!